Definition at line 42 of file QosConfig.h. Definition at line 47 of file QosConfig.h. Definition at line 34 of file QosConfig.cc. References aclDestroyAclList(), acl_tos::aclList, and acl_tos::next. Definition at line 51 of file QosConfig.h. Definition at line 52 of file QosConfig.h. 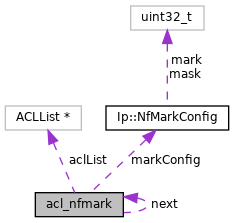 Referenced by free_acl_tos(), and Ip::Qos::Config::isAclNfmarkActive(). Definition at line 50 of file QosConfig.h. Referenced by aclFindNfMarkConfig(), free_acl_tos(), and Ip::Qos::Config::isAclNfmarkActive().